Arlington, VA, October 30, 2014 – PBS KIDS and Whole Foods Market (NASDAQ: WFM) announced a partnership today that will bring PBS KIDS’ line of educational and earth-friendly toys exclusively to the supermarket’s customers this holiday season. Starting this week, gift givers can find the PBS KIDS toy line, including classic wooden toys and soft plush animals, at Whole Foods Markets nationwide in the retailer’s Whole Body department. PBS KIDS’ new line of products is designed to inspire creative curiosity, while supporting the development of healthy, happy kids. One-hundred percent of PBS KIDS’ net proceeds will benefit the media brand’s mission of empowering children through knowledge, critical thinking and imagination, while Whole Foods Market will donate one percent of total sales, up to $25,000, to Whole Kids Foundation, an organization dedicated to improving children’s nutrition and wellness. Appropriate for young children ages six months to three years, the PBS KIDS toy line features: race cars made from recycled milk bottles; colorful, wooden vehicles assembled by hand from local wood in Vermont; shape sorters (recently named a National Parenting Publications Awards (NAPPA) silver award winner) and stackers that inspire a love for fruits and veggies; super soft plush animals made with phthalate- and PVC-free materials; and organic t-shirts and infant onesies with vintage designs. Each item in the PBS KIDS toy line is made with safe, non-toxic materials and inks, and all packaging is made from recycled materials. 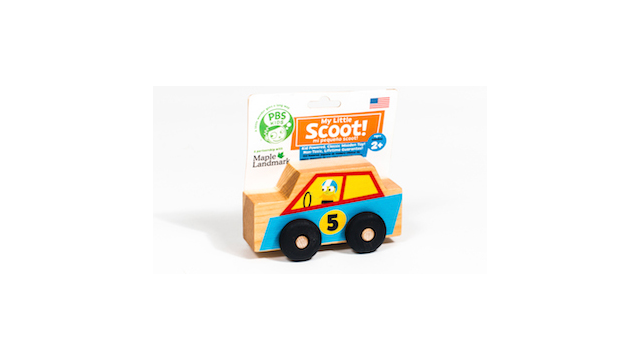 Many of the toys are produced in the USA from sustainable materials, responsibly harvested from local communities. “PBS KIDS is known for creating fun, educational content that encourages kids to learn by exploring the world around them,” said Jeanne Tamayo, Whole Foods Market’s global lifestyle buyer. “And that's the exact goal behind this new line of toys — to help our shoppers find new, exciting ways to teach their children through play. Whole Foods Market is proud to offer these toys to families exclusively this holiday season." In addition to finding the new line of PBS KIDS toys at Whole Foods Markets nationwide, consumers can purchase products online at shop.pbskids.org. PBS KIDS, the number one educational media brand for kids, offers all children the opportunity to explore new ideas and new worlds through television, online, mobile, and community-based programs. Kidscreen- and Webby-award winning pbskids.org provides engaging interactive content, including the PBS KIDS video player, now offering free streaming video accessible on computer- and mobile-device-based browsers. For more information on specific PBS KIDS content supporting literacy, science, math, and more, visit pbs.org/pressroom or follow PBS KIDS on Twitter and Facebook. Founded in 1980 in Austin, Texas, Whole Foods Market (wholefoodsmarket.com, NASDAQ: WFM), is the leading natural and organic food retailer. As America’s first national certified organic grocer, Whole Foods Market was named “America’s Healthiest Grocery Store” by Health magazine. The company's motto, “Whole Foods, Whole People, Whole Planet”™ captures its mission to ensure customer satisfaction and health, Team Member excellence and happiness, enhanced shareholder value, community support and environmental improvement. Thanks to the company’s more than 85,000 Team Members, Whole Foods Market has been ranked as one of the “100 Best Companies to Work For” in America by FORTUNE magazine for 17 consecutive years. In fiscal year 2013, the company had sales of $13 billion and currently has 399 stores in the U.S., Canada and the U.K.